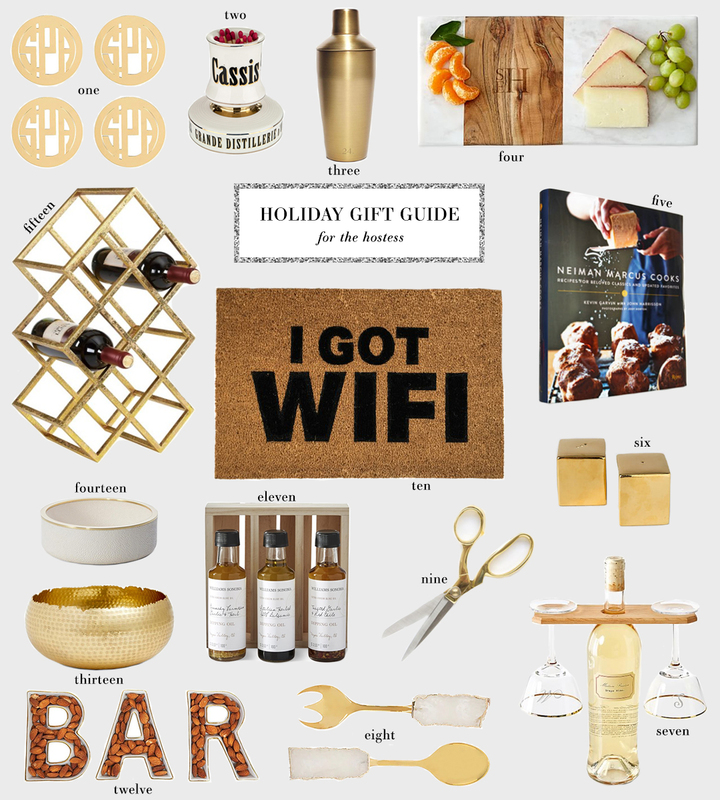 I’m SO excited to announce the launch of my annual holiday gift guide series! Starting today and leading up to Christmas, each Thursday you’ll find a wonderful selection of gift ideas for everyone on your list right here on the blog. The easiest way to find these posts is to click the “MORE” category in the black menu at the top of my website, and select “GIFT GUIDES” – or you can click this link and then bookmark the page! In addition to the items I feature in each collage, I’ll be rounding up even more present picks in the text section below for a variety of price points. Before we get into today’s roundup of gift ideas, I also wanted to announce an update to THE SHOP for the holiday season! I’ve added a brand new tab called The Holiday Shop, which features festive decor, holiday party looks and more must-haves for a fabulous holiday season. Check THE SHOP weekly for updates and fresh picks! For the friend that loves to bake, this three piece oven mitt + towel set is fun an festive for the season! Plus, it’s under $40. Trays are always so useful! I have at least one in nearly every room in my house. On top of just being pretty, they’re a chic way to keep things organized, separated and clean. This acrylic tray would blend seamlessly into any space, and comes with an option to monogram it! In case any of my friends or family are reading this, I love these linen napkins. So so pretty! You really can’t go wrong with a gorgeous picture frame like this one. Did you know Diptyque makes bath products in addition to candles? Gift this hand soap and lotion duo. So luxe! These gold pineapple bookends would be a stylish accent to any bookcase or etagere! Coffee table books are another great gift go-to for me. This Parisian Interiors book is a solid choice! For the gal that loves bubbles, these Champagne cocktail napkins are subtle but super cute. I have these geode coasters and receive so many questions and compliments about them! They’re $14 per coaster and come in a bunch of gorgeous colors! Get a matching set or go crazy with a mixed bag. Whether your friend is a lover of NYC, Paris or London, one of these skyline trinket dishes is bound to make her smile. I’ve been following A Cozy Kitchen on Instagram forever, and am constantly craving the recipes she posts! Would love to add her cookbook to my arsenal – it’s filled to the brim with cozy recipes that’ll warm you up from the inside out. these are such great picks!! love that wine + glass holder! So excited to start planning for the holidays! These are definitely great gift ideas! These are all such great gift ideas, and I love that they are all super affordable and practical! I’m beyond excited for your gift guides! I swear that’s how I shop every year!